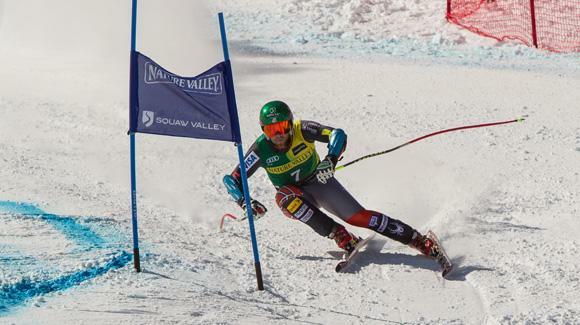 Travis Ganong, from Olympic Valley, won the men's Super G competition today at the Nature Valley Alpine Championships at Squaw Valley. Ganong won by a narrow margin (.20 second) over second place Jared Godberg. Third place went to Squaw Valley Ski Team member, Bryce Bennett. Saturday, March 23 will bring the Men's Slalom race, as well as a U.S. Ski Team Pro-Am Race. Slalom racing features the shortest course and the quickest turns. Each athlete gets two runs. The two runs are added together and the fastest total time determines the winner. The Championships will conclude Sunday with the Women's Slalom. Both days of Slalom racing will be held on Squaw's Exhibition Run. The vertical drop over the 2,165 foot course is 656 feet. Julia Mancuso, another Squaw athlete, won the women's Super G on Thursday. 500 skiers will compete throughout the five days of racing. Highlights of the Squaw Championships will air on NBC, Sunday at 9:00am.